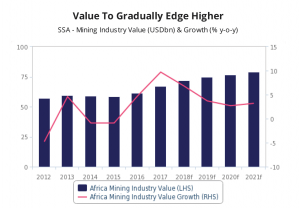 Despite the fact that, through the enactment of new laws and regulations, local governments in Sub-Saharan Africa are starting to claim a larger share of their countries’ mineral resource wealth, BMI Research believes that investments in the region will continue to rise in Q3-2018. In an industry overview published today, BMI presents the recent changes to the Democratic Republic of Congo’s mining code as an example of a situation that challenges all the parties involved, but that is very unlikely to cloud miners’ interest in venturing in the country. “On March 10 President Kabila signed into law a new mining code that will raise royalties on minerals across the board, as he tries to shore up the support and funding need to retain power. While these changes pose downside risks to the DRC’s investment profile, we do not expect them to impact our positive growth outlook for the country’s mining industry over the coming quarters,” the report reads. According to the market research firm, the DRC and others will benefit from mining mergers and acquisitions taking place thanks to improved balance sheets following a surge in prices for key commodities over 2017. A noteworthy case -the document states- is Glencore’s purchase of the remaining stakes in the Mutanda and Katanga copper-cobalt mines in the DRC for $922 million and $38 million, respectively. The firm foresees other major African players such as AngloGold, Randgold and Impala Platinum improving their profit margins in 2018, something that benefits hosts countries as well. BMI says that this would be the highest free cash flow in six years, which would support a return to growth strategies, probably with a focus on brownfield projects and partnerships. Not only in the DRC but in other places, miners will have to learn to navigate new ways to operate. In Zambia, for example, miners now have to transport 30% of their cargo for export by rail as the government is looking to revive local rail services. Mali, on the other hand, recently announced that it intends to draft a new mining code this year. On the risky side there is Tanzania, says BMI. According to the firm, asset sales and reconsiderations of planned investments are in the forecast due to John Pombe Magufuli government’s recent decision to restrict foreign banks, insurance companies and law firms working or financing the mining sector. “The new restrictions follow on from laws passed last year that ban the exports of gold/copper concentrate and allow the renegotiation of contracts with mining companies,” the market researcher explains. When looking at South Africa, BMI’s report is filled with good news. The election of Cyril Ramaphosa -the firm says- improves the country’s investment environment. In particular, BMI highlights the fact that the Chamber of Mines seems to be open to negotiations with the new administration, as it postponed its legal challenge to the mining charter introduced last year. “The appointment of Gwede Mantashe as the new head of South Africa’s Department of Mineral Resources will send further positive signals to investors that an agreement over the new charter in the coming months is possible, due to Mantashe’s popularity among major stakeholders in government and mining industry circles alike. We expect negotiations will lead to a more accommodating mining charter, through a reconsideration of controversial and legally questioned elements such as the requirement that a 30% black ownership participation rate must be maintained throughout the life of operating mines, even if black shareholders sell their position,” the report states.